The Theme Repeaters add-on will allow you to create, edit and load Ajax Load More repeater templates directly from your current theme folder. Gain complete control over Ajax Load More repeater templates while adding the ability to easily reuse templates throughout other sections of a website. 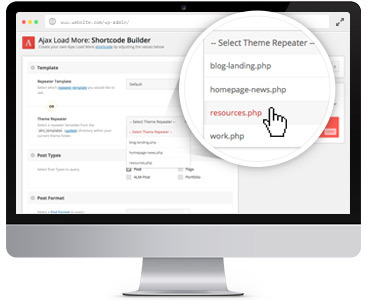 The Theme Repeaters add-on works by allowing repeater templates to be created, loaded and managed directly from the current theme directory vs the Ajax Load More plugin directory. Simply create a repeater template and upload the file to a sub-directory of your current theme – after Directory Selection has been configured on the Ajax Load More Settings screen, Theme Repeaters will automatically add the file to the list of available templates (see screenshot) and allow you to select the file while building a shortcode. If a theme_repeater template has been defined, Ajax Load More will load the selected template directly from the theme folder while running it’s loop. Storing repeater templates directly within a theme will allow website developers to easily maintain and manage reusable templates as well as include Ajax Load More with commercial themes. The following shortcode parameter is available with the Theme Repeaters add-on. The following screenshot illustrates the process of selecting a Theme Repeater template within the Ajax Load More Shortcode Builder. The following configuration option(s) will be available on the Ajax Load More Settings screen immediately following installation. A directory must be selected for Ajax Load More to understand where repeater templates are located. If a directory has not been specified, templates will be loaded from alm_templates whether it exists or not. Upon purchase of this add-on you will receive a confirmation/purchase receipt email. Your receipt will contain a direct link for downloading your copy of Ajax Load More: Theme Repeaters and a license key. After downloading the add-on, upload the unzipped files to your /wp-content/plugins/ directory or visit your plugins dashboard and upload the downloaded .zip under Add New. To activate your add-on and receive updates directly in your WordPress plugins dashboard users are required to enter the license key that was included with their purchase receipt. Visit the Licenses section within the Ajax Load More plugin. Enter the product key and click Activate License. If the status indicator turns green your add-on has been successfully activated (example below). If you did not receive your confirmation/purchase receipt email and license key, please check your spam/junk folder and if you still cannot locate the email please contact me at darren [at] connekthq.com or use the Product Support form on the website. Add the ability to reuse repeater templates throughout your entire website and not just with Ajax Load More. Edit and maintain repeater templates using your favorite code editor over an FTP connection. Added comfort of knowing that your repeater templates are safe and secure in your theme folder. Download & install this add-on immediately following a successful transaction. This plugin will receive update notifications directly within the WordPress Plugin dashboard - updates will be available free of charge for version 1.x users. Ajax Load More v2.7.3 or greater must be installed. SECURITY - Adding security patch to fix potential vulnerability in Theme Repeater file paths. UPDATE - added support for using Theme Repeater templates in the new Users add-on. UPDATE - added support for Gallery Field Type of the Advanced Custom Fields extensions. NEW - Adding new alm_get_rest_theme_repeater() function for compatibility wit REST API add-on. FIX - Adding new $alm_current; variable that will return the current item number relative to the active loop - must upgrade core Ajax Load More to 2.8.7. FIX - Fixed php warning that would appear upon plugin activation. FIX - Fixed issue with the passing of ALM template variables. NEW - Adding child theme support. BUG - Fix PHP warning for users with PHP version less than 5.4 installed.